When we see, and hear from outside and then when we really understand what it all means from within! Longish, title…but this is actually what I felt at the end of the Kanha’s Smokeless Chulah workshop. 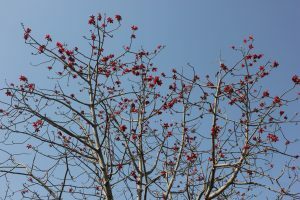 I have been to Kanha several times, but never peeped into the homes of people who lived there, never spoke to the tribal community, did not feel the sal trees or the mahua flowers and the palash flowers in my hands. 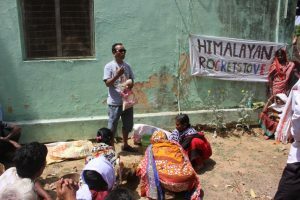 Because it was always about jungle safaris and clicking touristy pictures.The workshop that we set out to do was planned to be initially targeted towards 35 to 50 people but we had almost 150 people attending it and feeling positive about it. 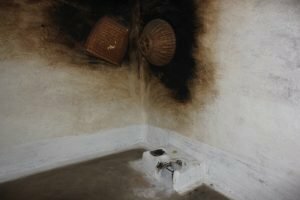 We actually went into the homes of the villagers and saw the damage that rudimentary stoves are doing to their walls and of course, to their lives. The blackness on the walls is visible to our eyes so I took pictures as a proof. Imagine what it must be doing to the lungs of the women and children whose lives revolve around this cooking process. 12 to 15 hours of the stoves burning, either to cook or to heat water even with the LPG. 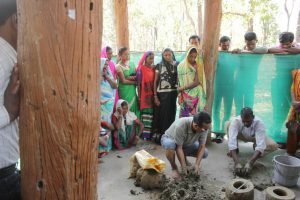 On the brighter side, I was very impressed by the work that the Madhya Pradesh Forest Department does for the community in Kanha by providing them LPG and motivating them about preserving their environment.One amazing remark about the people of Kanha confirmed that we were doing the smokeless chulah workshop for the right people. We were creating awareness amongst the community who are genuinely concerned about preserving their forests, their rivers and of course, their prized neighbour – the great Indian Tiger.Our host, Anjana S. Tirkey, Deputy Director, Buffer Kanha Tiger Reserve told us that people in Kanha have not sold themselves to commercialization and they still lead simple lives in harmony with the forest. Wow!! It’s heartening to hear this. These are the real climate change activists then. Anjana also spoke about how the community is very keen to protect the river Narmada and its life-giving waters to the state and this can only be done by protecting our forests and preserving the wood. Coming to forest firewood, we saw young girls carrying many kilos of wood on their backs. 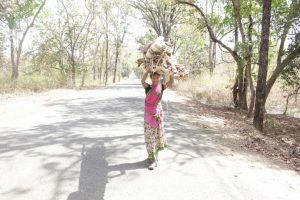 They walk 10 to 20kms each day into the forest to cut and collect. Their faces were tired and their eyes spelt confusion. Each moment spent in Kanha was a moment of truth for us. Stating the obvious, re-instating as to why the smokeless chulah initiative needs to gain much faster, bigger and more forceful winds. Because, the time is literally running out. Day 1 – We met with the forest officials and visited the venue for the 1st workshop. 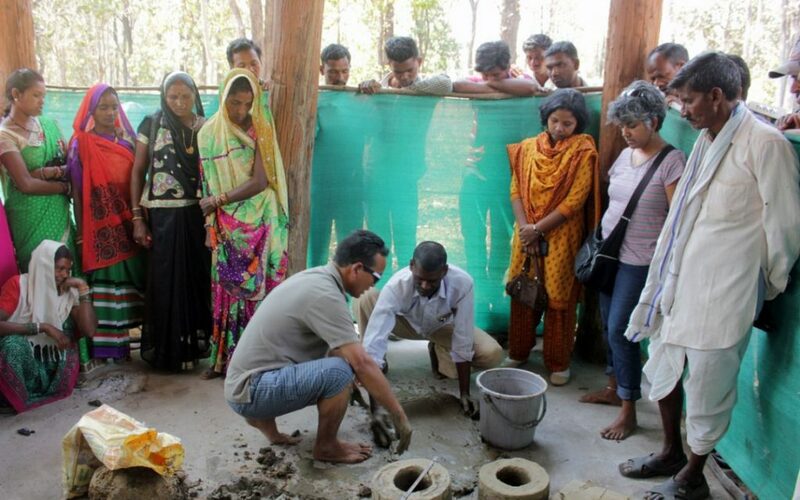 We got an understanding of the kind of participation we would expect the next day.The venue – Eco Center at Khatiya Zone of Kanha had a conference room which served as our venue to play the instruction video. Day 2 – We started the day with preparing donuts for both the workshop in the next two days. This came in pretty handy as the workshop can be literally completed in one day and the next morning. It also gave Lalita, Arjun and me time to make donuts ourselves. The instruction video was showed to all the forest department officials so they get an understanding of what will happen the next day. Day 3 – The workshop began at about 11:00 am in the morning. The community people were seated in the conference room where we showed the instruction videos. One interesting aspect which emerged was the use of LPG cylinder which the Government of India is now trying to provide free of cost to Below Poverty Line income families. But the use of Chulah still takes place in most homes with regards to boiling water. Also, the penetration of LPG is just about 15% and it will take a few years for 100% penetration. The villagers saw our smokeless Chulah as a replacement to their traditional chulah. We moved to the outdoor venue and Tanzin took over to explain the proportions and the mixture we need to prepare the donuts. This was followed by making of the donuts. We had almost 70 participants on Day 1 and they seemed convinced about the process however, they were very interested in the firing of the chulah. Once the Chulah was fired up, the villagers were convinced that this works. They also started discussing the possibilities of changing the height and size of the donuts that they would make in their homes. Day 4 – We travelled to the second location, Gadi which was about 2 hours drive from Khatiya. 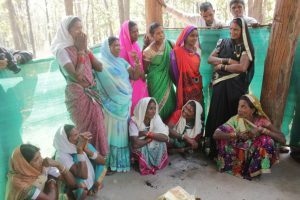 The format was the same, presentation in a sort of a meeting room to over 75 villagers followed by demonstration in the outdoors. Once again, they quickly picked up mixing of the clay and making of the donuts. The firing process was something that they curiously looked at and were thrilled about how quickly and efficiently it started working. The Smokeless Chulah team will return to this location very soon to check the progress of the demonstration and also to conduct more such workshops. 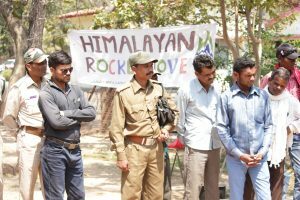 The community and the forest department have seen merit in this initiative and that’s very heartening for us. My keyboard is still raring to rattle away as there is lots more that I want to say…but in the end, I died and went to heaven twice over in this trip – first when I saw a shooting star when the lights suddenly went out and the mesmerising light show continued with billion stars and glow worms. 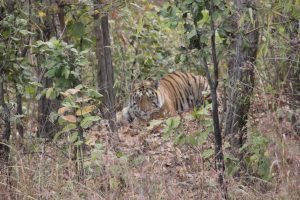 And second, when we saw a tigress so beautiful! Just the reasons why we need to fight and conserve what we have!